Charles S. Richmond and his wife, Sylvia Rhea Bryan lived at 27 High St., Hayesville, Ohio. They lived there from about 1945 to 1947. At that time there were no addresses and mail was picked up at the post office. They were divorced around 1947. He is buried in the Hayesville-Vermillion Cemetery, Hayesville, Ohio. 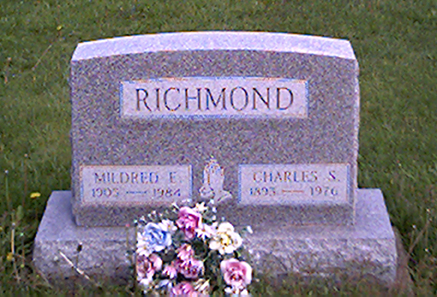 He is buried with his second wife, Mildred E.